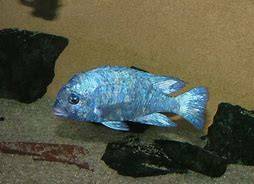 As the Fish of the Month for August, there will a bag of 4 x Placidochromis sp. Phenochilus Tanzania around 5cm available at the PCS Meeting for auction. These are special lots to raise money for Stuart Grant Fund for Cichlid Preservation and have kindly been supplied by one of our PCS Members - Brenno71. 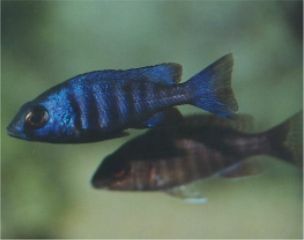 Placidochromis sp. “phenochilus Tanzania” is a beautiful, interesting and undemanding Malawi haplochromine. This fish is the closest thing to an OB (orange blotched, but a term used for fish with blotching) Malawi hap you’re going to see. 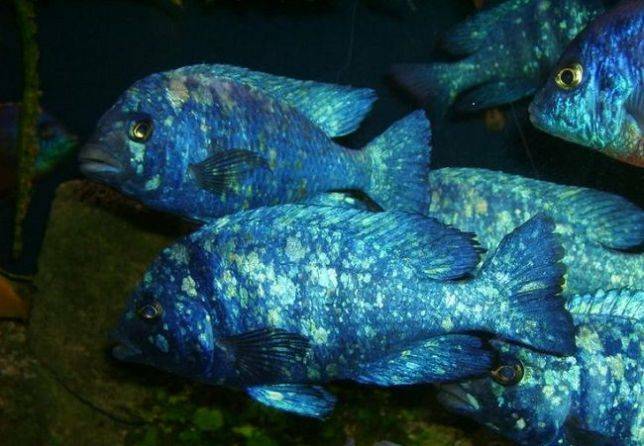 Males are a gorgeous dark blue with nice contrasting metallic white blotches, giving them their common name, The Star Sapphire Cichlid. The colors of the fish only intensify with age and it is an impressive sight to see a full grown ten inch male with stunning colors. At around three inches, the fish turn solid blue. When the fish reach four to five inches they begin to develop their white spotting. Every male looks different with some having more or less blotching than others. Females are generally smaller (six inches maximum length) and far less colorful. The females are silver with a nice black throat, black barring, and a blue sheen. Females only look nicer with age and older females can develop a fair amount of blue. There are two variants in the lake, but only that from Tanzania develops the spots. Those from Mdoka to Chirwa Island on the Malawi side of the lake are solid blue with white lips, and lack blue bars. Females are typically silver with the black vertical bars, but older females often attain partial or complete blue coloring in the aquarium. The male grows to a length of about 10" (25 cm) with the female being smaller at about 6" (15 cm). 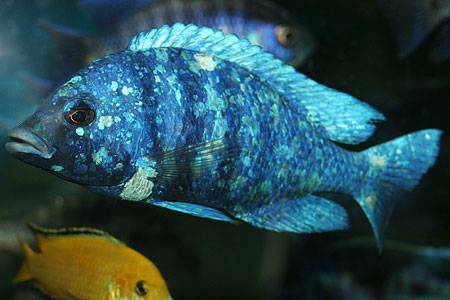 Kingdom: Animalia, Phylum: Chordata, Class: Actinopterygii, Order: Perciformes, Family: Cichlidae, Genus: Placidochromis, Species: phenochilus Tanzania. They are found in Lake Malawi, Africa at various sites around the Northeastern shoreline between Makonde and Lupingu in Tanzania and at Kasinda in Malawi. They live in shallow, sediment rich areas of the lake. In the wild, Placidochromis sp. ''Phenochilus Tanzania'' is seen following foraging species, such as Taeniolethrinops praeorbitalis, just like C. moorii and P. electra. These foot-long cichlids filter large amounts of sand through their gills and a lot of detritus is stirred up during the process. Placidochromis sp. ''Phenochilus Tanzania'' follows behind, like a dog on its heels, but T. praeorbitalis doesn't seem to mind. The amount of food exposed by the plowing activities of such diggers may not be sufficient for more than one adult follower, who depends exclusively upon this means of feeding. Consequently, individuals of the same species are wary approaching an "occupied" forager. An adult that has claimed a forager will usually signal ownership to others by taking on territorial coloration. Keeping the Star Sapphire Cichlid poses few issues. It is a docile, yet active species; in my opinion, they require a four foot tank because of their activity. A 320 litre aquarium comfortably houses a breeding group of seven 4 - 7 inch specimens. Ideally groups consisting of larger individuals should be housed in six foot tanks of at least 450 litres. The only time you ever witness aggression in this species is during spawning, and even then it will likely be minimal. Like all Lake Malawi cichlids, hard, alkaline water is desired. I personally like to decorate the tank for this species with a sand substrate and rather few rocks in an attempt to mimic their natural habitat. Over a sand substrate these fish will actively search for food in the sand. 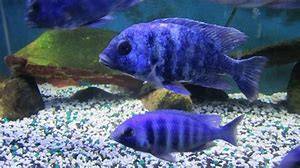 The Star Sapphire Cichlid is easy to mix with other Lake Malawi cichlids. Mild-mannered mbuna species, Malawi peacocks, or a docile Malawi haplochromines all make good tankmates. Placidochromis sp. “phenochilus Tanzania” is fairly easy to spawn. The fish is a maternal mouth brooder and will start to breed at around four inches long. It usually takes about eight months to reach this size as this species doesn’t grow super fast. 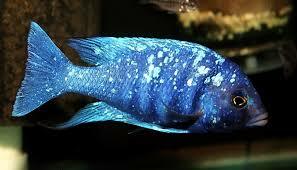 The Star Sapphire Cichlid will excavate a small pit in which they spawn. Females are usually good holders and will typically hold to term, which is about three weeks. 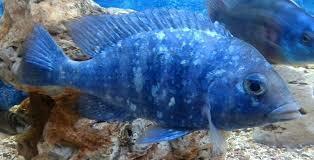 It’s important to note that holding females are not always easy to notice compared to some other Malawi cichlids. The buccal cavity does not seem to distend very far when these fish are holding. The best way to realize that the fish have spawned is to monitor their behavior. Not only will females stop feeding when holding, but their mouths will have distinct “chewing” movements. Around the three week mark, It is suggested to strip the female as the fry are free swimming or at least really close to free swimming. A spawn is usually around 20-50 fry depending on the size and age of the female. The fry are rather large and easy to raise. They grow quickly on baby brine shrimp or crushed flake. Around two months of age the fry are around one inch long. Overall Placidochromis sp. “phenochilus Tanzania” is a delightful species to keep. A truly breathtaking species, it would be a welcome addition to almost any Malawi show tank. Its undemanding and peaceful nature makes it a wonderful aquarium resident. This species seems to be popular in the aquarium trade at the moment and is usually available from aquarists as well as some fish stores. Eccles, D.H. & Trewavas, E. (1989) Malawian cichlid fishes. The classification of some Haplochromine genera. Lake Fish Movies, Herten, Germany, 335 pp. Konings, A. 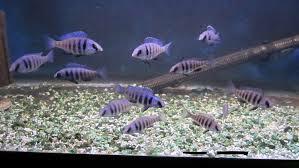 (2007) Malaǒi cichlids in their natural habitat. 4th ed., Cichlid Press, El Paso, Texas, 424 pp. Trewavas, E. (1935) A synopsis of the cichlid fishes of Lake Nyasa. Annals and Magazine of Natural History, 10(16), 65–118.